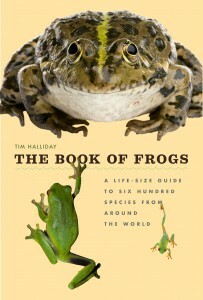 Boing Boing recently profiled Tim Halliday’s The Book of Frogs: A Life-Size Guide to Six Hundred Species from Around the World, but the real coup was a live link to sample pages, which showcase some of the majestically weird amphibians curated therein. You can see a handful of those images after the jump, but be sure to check out a glossy PDF of even more, via (full-size) additional samples posted to the book’s UCP site. *** To read more about The Book of Frogs, click here. . . .
What follows below is a very brief excerpt from a feature-length interview with Dave Hickey, whose book 25 Women: Essays on Their Art published this fall, over at Momus. *** Tell me about the timing. Why did you decide to produce 25 Women when you did? I was putting together a book of what I considered to be my best essays about what I considered to be the best art. I got up to about ten or twelve essays and I realized that most of these essays were about the art of women artists, so I shifted my hand on the tiller. Also, I wanted to memorialize Marcia Tucker, so I did that. I thought it would be a kick. You say in your introduction that it’s not “a fair book.” What do you mean by that? How would it look if it was fair? 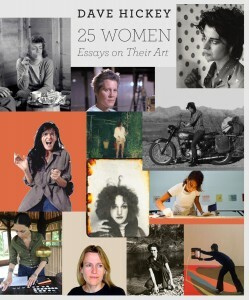 Well, there are lots of women artists whose work I like, about whom I never had a chance to write. Agnes Martin, Cindy Sherman, and Hannah Wilke come to mind. This was mostly in the seventies when men couldn’t write about women artists if a woman writer was available, and there always was. I also wrote some essays . 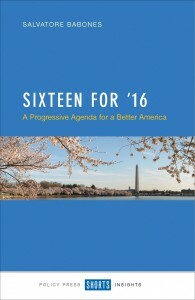 . .
A free chapter from Sixteen for ’16: A Progressive Agenda for a Better America by Salvatore Babones (Policy Press) *** Back in the good old days, that is to say the mid-1990s, taxpayers with annual incomes over $500,000 paid federal income taxes at an average effective rate of 30.4%. For 2012, the latest year for which data are available, the equivalent figure was 22.0%. The much-ballyhooed January 1, 2013 tax deal that made the Bush-era tax cuts permanent for all except the very well-off will do little to reverse this trend: The deal that passed Congress only restores pre-Bush rates on the last few dollars of earned income, not on the majority of earned income, on corporate dividends, or on most investment gains. Someone has had a very big tax cut in recent years, and the chances are that someone is not you. In the 1990s taxes on high incomes were already low by historical standards. Today, they are even lower. The super-rich are able to lower their taxes even further through a multitude of tax minimization and tax avoidance strategies. 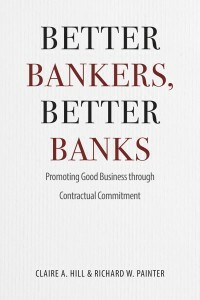 The very tax system itself has in many ways been structured to meet the needs of the super-rich, resulting in a . . .
A recent New York Times piece on the necessary culpability of bankers in bank misconduct builds on interviews with Claire A. Hill and Richard W. Painter, the authors of Better Bankers, Better Banks: Promoting Good Business through Contractual Commitment, which argues that it’s the bankers’ ability to hide behind their banks to dodge any personal stakes in the hefty fines, penalties, and legal fees levied by the government in the wake of the financial crisis of 2008, or any forthcoming. And Hill and Painter have a plan for how to change that—make bankers personally liable. Here’s a bit from the NYT: A different proposal comes in a new book by Claire A. Hill and Richard W. Painter, professors at the University of Minnesota Law School. In “Better Bankers, Better Banks,” they argue for making financial executives personally liable for a portion of any fines and fraud-based judgments a bank enters into, including legal settlements. The professors call this covenant banking. And it looks a lot like the kind of personal liability that was a fact of life among the top Wall Street firms when they were private partnerships. With their own money at risk, partners of Salomon Brothers, Lehman Brothers and Goldman Sachs were much . . .
Click here to listen to author Phaedra Daipha’s recent appearance on the BBC 4’s Thinking Allowed. 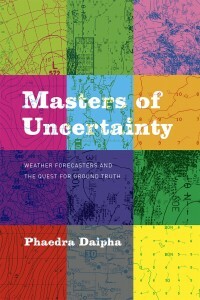 During her segment, Daipha delves into some of the extensive ethnographic fieldwork she performed at a northeastern office of the National Weather Bureau, which helped to generate her recent book Masters of Uncertainty: Weather Forecasters and the Quest for Ground Truth. In the book, Daipha argues that weather forecasting is a craft-based practice—and as neither artists nor scientists, its practitioners are closer to something like improvisational data-junkies, odd oracles for a labor of anticipation. From the BBC’s synopsis: Weather forecasting: Laurie Taylor explores a scientific art form rooted in unpredictability. He talks to Phaedra Daipha, Assistant Professor of Sociology at Rutgers University, who spent years immersing herself in a regional office of the National Weather Service in America. How do forecasters decide if a storm is to be described as severe or hazardous; or a day is breezy or brisk? Do they master uncertainty any better than other expert decision makers such as stockbrokers and poker players? Charged with the onerous responsibility of protecting the life and property of US citizens, how do they navigate the uncertain and chaotic nature of the atmosphere? To read more about Masters . . . The most recent issue of Commonweal includes “The River Runs On: Norman Maclean’s Christian Tragedies,” a long-form piece by Timothy B. Schilling, who goes on to read Maclean (expectedly, given the title) through both Christianity and tragedy—but most compellingly, through the author’s own often contradictory and ambivalent relationship to religion. 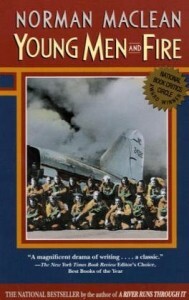 You can read the piece in full here; a brief excerpt from Young Men and Fire that situates the Smokejumpers—first responders to the Mann Gulch fire of 1949, from which the book takes its name— in this context follows below. Maclean tells us that most of the Smokejumpers believe in God. “You wouldn’t dare jump,” they say, “if it was empty out there.” But of the sixteen who descended to fight the fire, only three survived. What then—for them, for us—is the last word in this story? Does the Mann Gulch fire reveal the ultimate tragedy of all human experience? Or does it enjoin us to embrace the world’s faith traditions in looking for a life and a truth beyond death? As in A River Runs Through It, Maclean counters fatalism with Christian symbols and biblical allusions, including references to the Stations of the Cross, the Mass, Calvary, and the Book of Job. He . 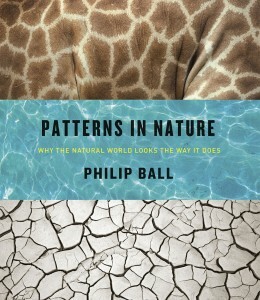 . .
Advanced praise for Philip Ball’s forthcoming Patterns in Nature: Why the Natural World Looks the Way It Does (April 2016), from Publishers Weekly: Acclaimed English science writer Ball (Invisible: The Dangerous Allure of the Unseen) curates a visually striking, riotously colorful photographic display of the most dramatic examples of the “sheer splendor” of physical patterns in the natural world. He lightly ties the work together with snippets of scientific history, using bits of physics, chemistry, and mathematics to show that although patterns in living beings can offer clear, functional evolutionary advantages, the small set of design elements that we can see—symmetries, branching fractals, spirals, flowing swirls, spots, and stripes—come from a basic set of organizing properties of growth and equilibrium seeking. Ball ranges across the whole spectrum of creation—from the living to the nonliving, and from the macroscopic to the microscopic—for displays of nature’s patterned beauty. He finds symmetry in grains of pollen, drops of falling water, and owl’s eyes; fractals in leaf veins, lungs, and nebulae; spirals in seashells, sunflowers, and cyclones; and flow patterns in wood grain, flocks of birds, and dunes on Mars. This is formidable eye candy for the I-love-science crowd, sure to spark a sense of impressed . 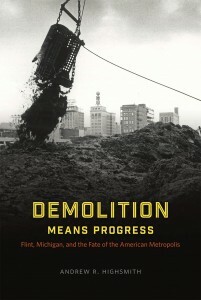 . .
Below follows an excerpt from “Flint’s toxic water crisis was 50 years in the making,” Andrew R. Highsmith’s op-ed for the Los Angeles Times, which builds on the scholarship of his book Demolition Means Progress: Flint, Michigan, and the Fate of the American Metropolis. Read his piece in full here. *** As with so many environmental disasters, this one was preventable. Evidence suggests that the simple failure to use proper anti-corrosive agents led to the leaching of lead into the city’s water. It has also become apparent that the slow responses of local, state and federal officials to this crisis — as well as their penchant for obfuscation — prolonged the lead exposure. It would be a mistake, however, to conclude that Flint’s predicament is simply the result of government mismanagement. It’s also the product of a variety of larger structural problems that are much more difficult to untangle and remedy. Over the past three-quarters of a century, waves of deindustrialization, disinvestment and depopulation eviscerated Flint’s tax base, making it all but impossible to improve — or even maintain — the city’s crumbling infrastructure. Flint — which once claimed 200,000 residents — now contains fewer than 100,000, nearly half impoverished, more than half African American. . . .